We’re in the cosy event space at Hamilton House. It’s the first ‘Hot Pot Cinema’, so we’ve eaten food lovingly prepared by the Coexist Community Kitchen and have now turned our chairs towards the stark light from the film screen. 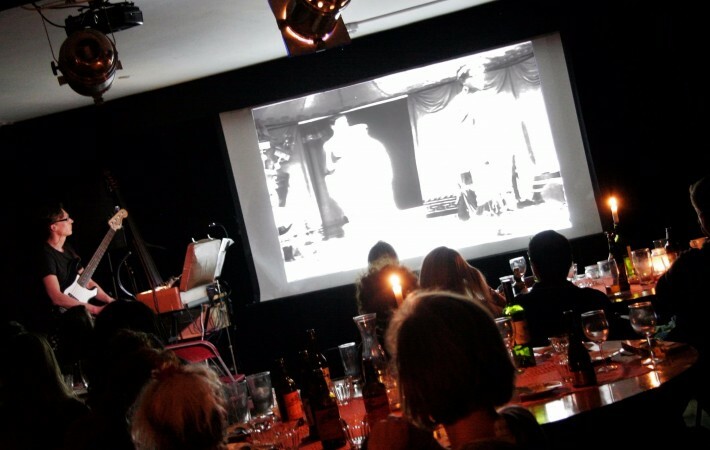 The only other light is from the corner where a tall man in black is intently bent to his task – Epistrophe Smith, and it’s the first performance of his new soundtrack for the classic silent 1914 film Cabiria. Running for two hours the plot involves subterfuge and conquest, friendship and loyalty, war and imprisonment. So, big themes demanding an epic accompaniment. No mean feat for a contemporary composer who has to find a way to connect our twenty first century minds with early twentieth century imagery and make all those highs and lows come alive. And it works. The action (and there’s plenty of it) is driven by a seamless thread of rhythmic pattern, like the heartbeat of the film. 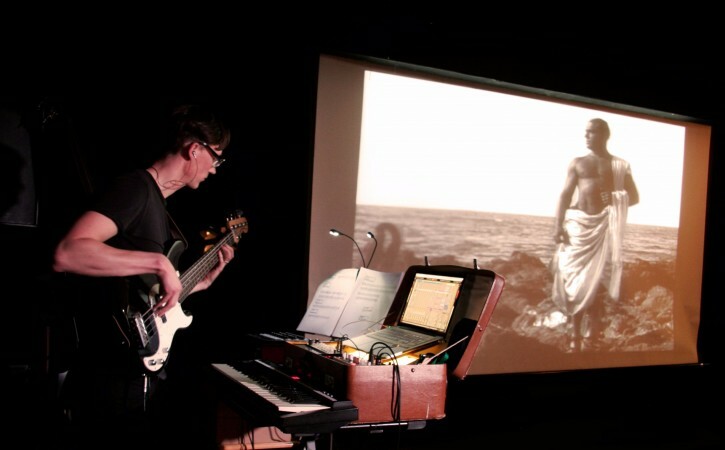 The mood changes in the film and music blend together in synchronicity as Epistrophe Smith shifts from synthesiser, bass unit, keyboard, double bass, electric bass and acoustic guitar to create a swirling soundscape. Improvisation over pre-recorded loops keeps it alive and moving. Genre? It’s tight techno and electronica with an undercurrent of jazz. Sometimes it’s all about the beat, with colliding layers of rhythm, sometimes a fragile tune takes over, and sometimes the bass is king. As the dark-eyed maiden weeps and wails, gentle melody becomes woven into the insistent beat; a jazzy bass-line pushes through as Carthage is plundered by the Romans. Why this film? Epistrophe Smith explains: “It was the first movie camera film and the impact of Cabiria on the film industry was incredible. I felt it could do with a new audience seeing it.” It’s been said that its director, Giovanni Pastrone, invented the epic movie which had a huge influence on American cinema. 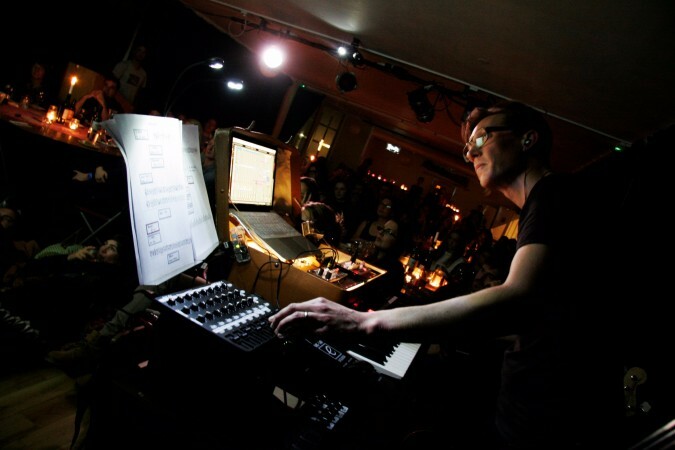 Epistrophe Smith comes from a jazz background – electronica is an unusual genre for a musician of this type to embrace. “It’s been a long journey but I’ve come round to loving it,” he says. Part of that journey has been influenced by Four Tet, John Hopkins and Nils Frahm, and you can hear their echoes in the music. But a big difference is that he doesn’t use samples, and live improvisation is an important part of the music. “I’m not a DJ and I didn’t want to be someone with just head down, twiddling knobs. I want to do something that’s more exciting for the audience – that’s different every time,” he says. The result is a creative and exciting mix of digital and live sound that keeps the audience’s feet tapping with eyes glued to the screen for the two hours. Watch out next spring to see what Epistrophe Smith has concocted – it promises to be very interesting. Tagged cabiria, canteen, epistrophe smith, hamilton house. Bookmark the permalink.